Check out our portfolio of our projects that have been in collaboration from many different organisations from housing trusts,, community groups, local authorities and NGOs. If you are a group or organisation who is interested in collaborating with us, check out are services and how we work here or get in contact. WSW created an outdoor gallery on a newly pedestrianised road in Walthamstow Central, part of LBWF's Mini Holland scheme. Artists include ATM and Mark McClure. 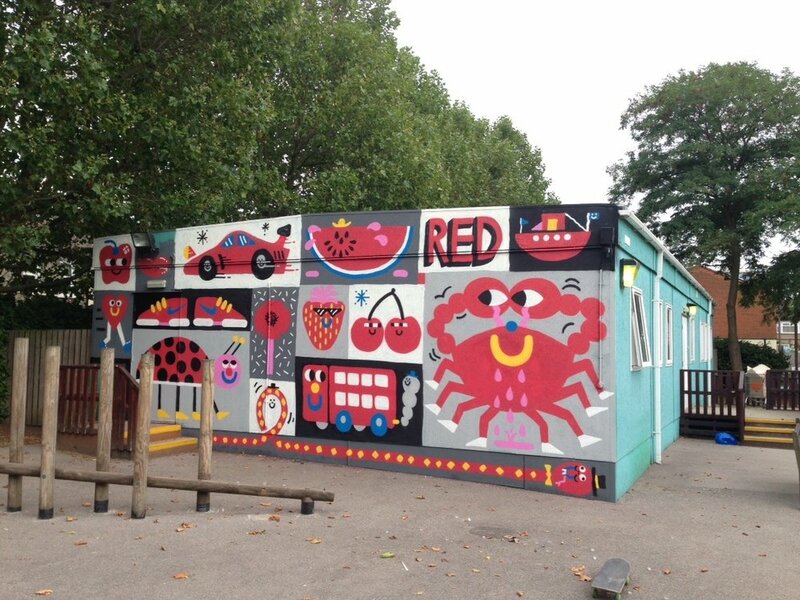 The signage was painted by Mia Warner, a Leyton artist. We worked with Frankie Strand and Elno to paint two caravans being sent to the migrants in Calais. The campaign was in memory of Jo Cox who campaigned for people fleeing war and persecution, and organised by Walthamstow MP Stella Creasy and Jungle Canopy as well as Side by Side Refugees, with coordination from local residents Natalie Sloan & Linsey Winton. WSW and STATIC revamped the Flower Pot, Wood Street, with the installation of STATIC's flower girl. The entire pub was given a fresh lick of paint and new signage was painted by local signwriter Mia Warner. Heroes of Waltham Forest celebrates people who have added to the creative cultural heritage of the borough - past, present and future. Figures to date are Neon artist Chris Bracey and William Morris. Nominate your own hero by clicking here. A resident consultation developed the theme for the mural. With nature and wildlife the preference to reflect the Hut's immediate surroundings there was only one man for the job. Xenz painted the Higham Hill Hut over three days. The finished mural includes oxes, geese, flowers (specifically poppies), birds and leaves/foliage - the poppies also refer to Remembrance Day, honouring those who have sacrificed themselves to secure and protect our freedom. Our moveable plywood cube was erected and artists were invited down to paint over the weekend - artists Olivier Roubieu, Elno, Carleen De Souza, Woskerski, giving visitors the chance to watch the painting in action. Working with the Adult Learning Day Centre, located at 247 Markhouse Road, to bring the building to life to engage with their clients. A workshop was carried out with the Centre users to develop themes for the design and this was coupled with a public consultation. With key themes established we launched a poll to choose the final design.The installation took place over 3 weeks during the summer when weather conditions were at their optimum. Our inaugural street art event ran over 3 weeks and involved 18 artists painting across Walthamstow. Backing from Skyjack as part of their 30 for 30 initiative & sponsorship Fermax enabled us to paint over 15 murals to raise awareness for the need of affordable artist workspace in urban areas such as London. 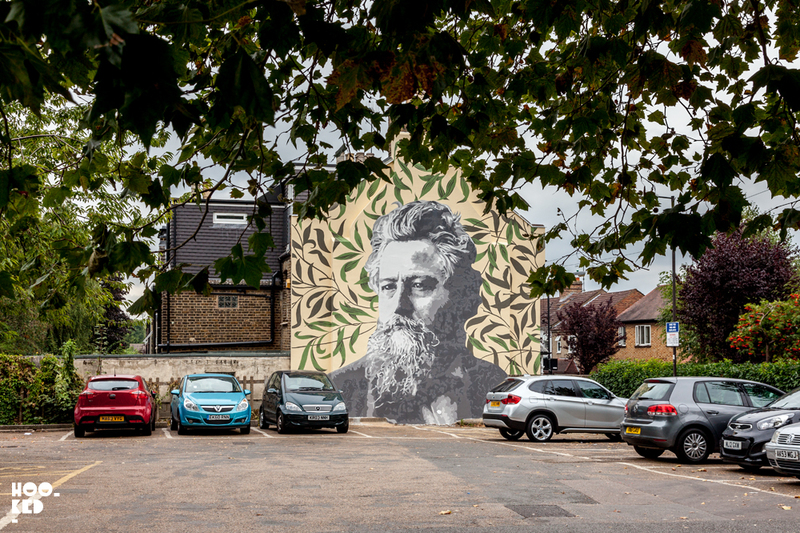 Celebrating William Morris has always been a goal of WSW and after painting a 5x5m portrait of the man himself it was always going to be ATMA to do the job. Securing the gable end wall next to the William Morris gallery was the first coup for the team but when they realised they could not only paint the mural but use it as an opportunity to embrace Morris' quote "Have nothing in your houses that you do not know to be useful or believe to be beautiful." Working with the William Morris Big Local, they enlisted the help of the HEET project to help locating the right organisation to install side insulation to improve on the home's energy efficiency and also flatten the wall to make it a perfect surface to paint. Retrofit Works and Be Constructive came forward and aided the installation process prior to painting. A public consultation took place to decide between 6 of Morris' iconic patterns and reached over 1100 votes. Check out the full case study below and infographic below. 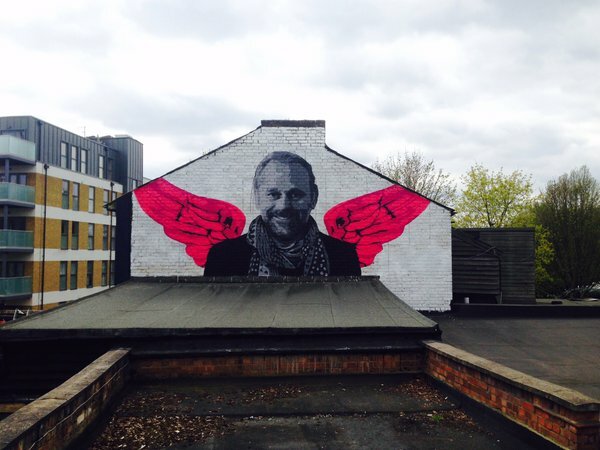 Already supporting local initiatives and events such as Hackney WickED, L&Q identified the negative attitude held by artists towards developers and constructors developing the area and wanted to implement a campaign to offer a creative outlet that would mitigate the graffiti seen across other developments. 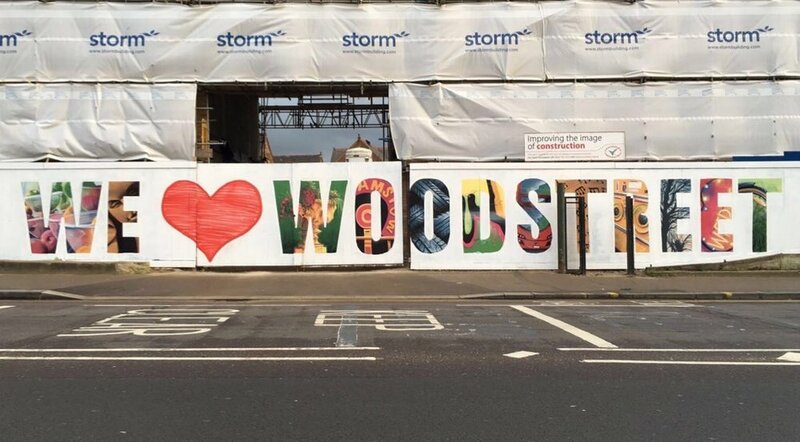 L&Q sought the help of Wood Street Walls CIC, whose artists are currently based in Hackney Wick, to consult on the approach to ensure local talent was represented and 180m of hoardings surrounding the perimeter of the site was covered with artwork. To commemorate former resident Stuart Freeborn, the British make up artist renowned for his contribution to the Star Wars franchise and to tie in with the launch of the new movie - The Force Awakens - WSW worked with local artists to paint three Star Wars themed murals. We worked with local Walthamstow MP Stella Creasy & the WE17 community group to create a map of local shops and businesses to encourage residents to participate in December 2016. The map was launched at the beginning of December, with over 4000 maps being delivered by local business Parker Dairies. It was the first map to feature Wood Street Studios, with the map design created by illustrator & graphic designer Aimee Capstick. As part of the redevelopment of Walthamstow Central station, LBWF wanted to install a mural that would capture the essence of the area. We wanted to harness the local community’s input so carried out a series of polls - in person at the station, online and on our stall at the Walthamstow Garden Party - which resulted in over 500 votes. The mural was painted by local art group Bread Collective. As part of a school make over, Thomas Gamuel School wanted to brighten up its porter cabins with art to inspire the students. Having worked with Malarko in Leyton and seeing the impact his art had on passing school kids he was the perfect fit for the job. Taking inspiration from a kids alphabet book he used colours and themes that would educate as well as ignite their creativity. When the term started WSW and Malarko lead a workshop in which the pupils were encouraged to develop characters using the murals as inspiration. 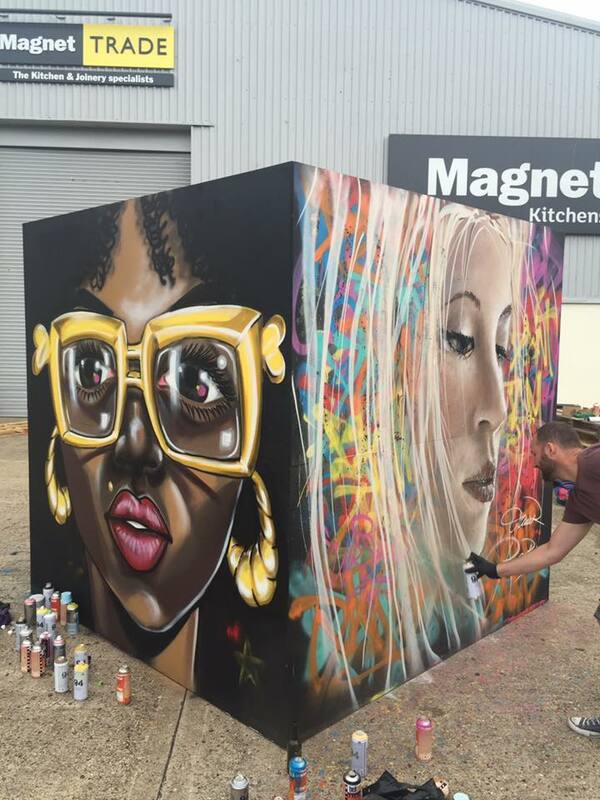 We erected our street art cube for the first time and offered visitors to the event a free activity to be part of a live mural painted over the weekend. We also had a stall on which kids could create their own bedroom signs using stencils, wood and spray paint at a cost of £2 per child. Visitors were also able to find out more about Wood Street Walls, vote in the This is E17 poll, purchase STATIC artwork and enter a raffle. Over the weekend we engaged with over 5000 people directly and raised over £700 for Wood Street Studios. We collaborated with Waltham Forest College to create a mural for East Thames new Foundry Mews development, celebrating the sites & landmarks in and around Wood Street and Walthamstow, creating a typeface mural by one of our network of artists. We launched a crowd funding campaign to raise money to transform an empty building in to a creative hub in Wood Street. More info to follow. Wood Street Wall artist Frankie Strand designed and delivered a mural for the new pocket park for the residents of Ive Farm close, with the input from Waltham Forest Council. 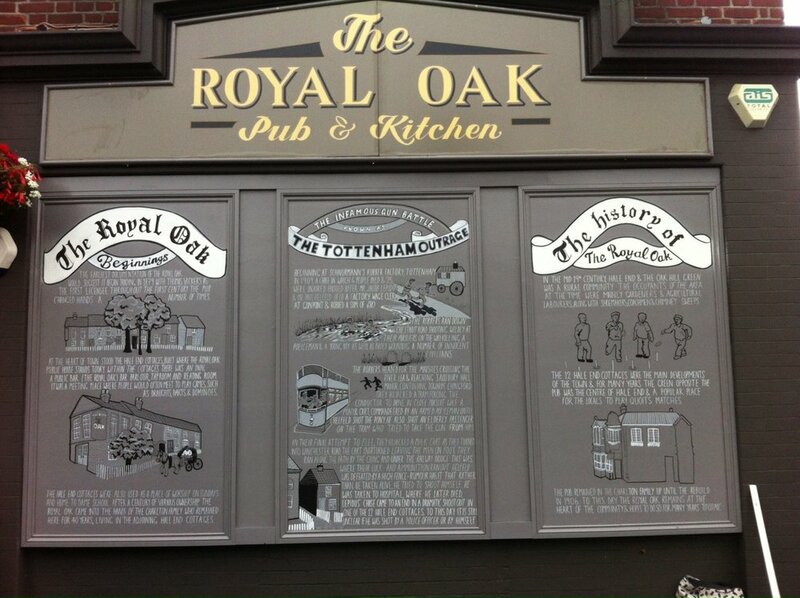 With the help and coordination of local community group, the Highams Park Planning Committee, Wood Street Walls worked with the landlady of the Royal Oak Pub in Highams Park to create mural to celebrate the history of the local area as part of the pub's anniversary celebrations. After reviewing the research provided by the staff at The Royal Oak and the HPPC, WSW artist Frankie Strand designed and painted a tryptic, referencing the history of the public house and the Tottenham Outrage. WSW artist Frankie painted a design created by Ben Normanton for Voodoo Ray's pop up located in Boxpark, Shoreditch.